The Dawn Burnout Recovery Programme specialises in treating corporate and executive clients who require positive lifestyle changes and want to restore balance in their lives. 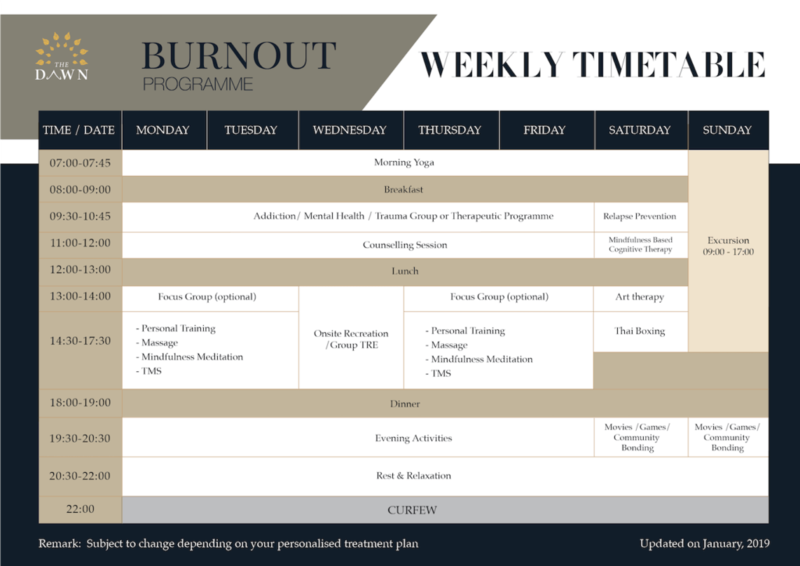 Unlike a traditional rehab programme, our Burnout Programme is created to help address and work on any issues that contribute to, or accompany, executive burnout symptoms such as substance abuse, stress, chronic pain and other mental health issues. Additionally, our highly personalised programme offers a flexible and varied schedule to suit each individuals exact needs. An innovative exercise that assists the body in releasing deep muscular patterns of stress. A common form of talk-therapy, CBT helps individuals identify negative thoughts and behaviours and learn healthier skills and habits. A behavioural technology that helps decrease anxiety, reduces stress and overcome neuroses. Burnout is a state of mental, physical and emotional exhaustion that is caused by prolonged and excessive stress that can happen to anyone, especially those high-functioning professionals who constantly operate under stressful situations. It happens when a person feels emotionally drained, overwhelmed and incapable of meeting endless demands. As stress keeps getting worse, they start to lack the motivation and interest that is essential to continue working. Burnout lowers productivity and drains a persons energy, which can make them more cynical, resentful, helpless and hopeless. Ultimately, they will feel as though they have nothing left to give. Burnout can be treated through a personalised treatment programme that is created to help people overcome its harmful effects and give them the tools that they need to cope with stress in the future. The Dawn offers an effective treatment method that can help people come to terms with the changes that they need to restore balance in their lives. People who have self-medicated with drugs, alcohol or other addictive behaviours can also get the help that they need. Clients have a minimum of ten 1:1 therapy sessions with a qualified psychotherapist, which includes integrative Coaching, NLP or mindfulness-based therapy. During these sessions, Cognitive Behavioural Therapy (CBT) is used to target the root cause of symptoms. Burnout-focused CBT addresses the cognitive distortions and maladaptive impaired thinking associated with stress and allows for effective cognitive restructuring. The Dawn’s Executive Burnout Programme helps individuals identify the root cause of their stress and provides healthy ways to deal with everyday pressures, to achieve a more relaxed and happier state. Our tailor-made programme is specially designed for professionals who want results as quickly as possible. It is an integrated mind-body wellness programme that incorporates comprehensive therapy, life coaching, stress management, fitness, delicious meals and luxurious private accommodations. Our team is the best in the field and focused solely on our clients and their success. The programme also includes the development of individual recovery plan, drawn up together with a counsellor. The plan includes detailed measures to ensure the maintenance of healthy habits after treatment and to prevent clients falling back into your old burnout patterns. Why choose our burnout recovery programme? Located in Chiang Mai, Northern Thailand, The Dawn Medical Rehab & Wellness Centre enjoys easy connection from Bangkok and other major Asian cities. Our facility is perfectly positioned in a tranquil private setting. Our discreet location and strict information sharing protocols ensure you receive not only first-class burnout treatment but also guaranteed confidentiality and anonymity. Treatment is received in a Riverside facility which is immaculately maintained and designed to provide a peaceful sanctuary that promotes physical, mental, and spiritual healing and each client is assigned a stylish private room. World-renowned Thai hospitality and high-quality care and service is part of everyday life at The Dawn. Since we understand the high paced lifestyle of the business world, we have designed this 2-week Executive Burnout Programme to cater to your needs and help you get back on track fast! We also offer a specialised 28-day programme that emulates the features of the 2-week programme but goes much deeper, allowing the necessary time for transition, counselling and reflection to facilitate optimal change and healing. What are the effects of adrenal burnout?